Everyone says that parenthood is one big party. Right? Isn't that what everyone says? 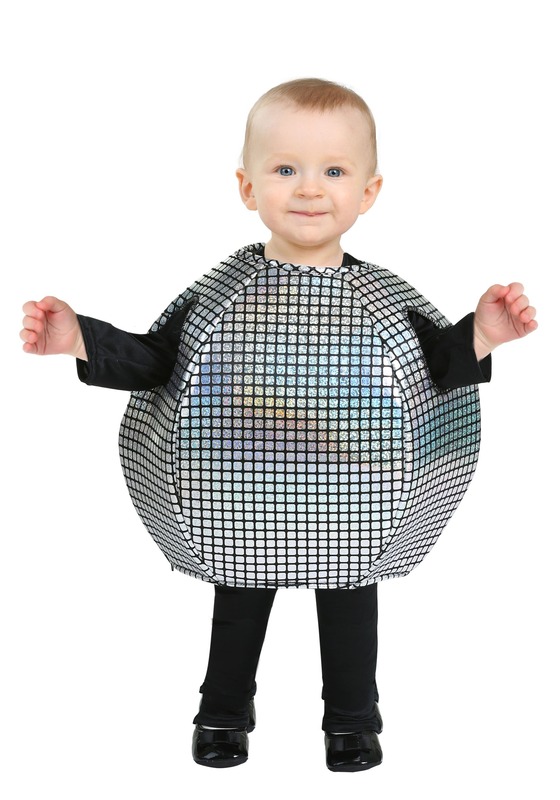 Well, maybe parenting a toddler isn't the equivalent of going to a 24/7 discothèque but you day to day with your little nipper could be compared to living inside a disco. Much like the inside of an early eighties dance club, life with your disco kid can be loud, messy, and busiest in the wee hours of the morning. Just think, when your dancing baby wakes you up at three o'clock in the morning you don't even have to dress up for the action anymore. No, you don't have to get a perm or put on your platform shoes to hear the soulful wailing of this infant star, just warm up some milk and hold on for dear life because if there's one thing disco taught us, it's all about staying alive. To make your postmidnight parties more of a ball you could always add a little more sparkle in the mix. If the baby doesn't feel like sleeping, might as well make baby the life of the party. All you need to do is slide this disco ball over that wild child's head! Maybe the baby is still yowling but at the mom and dad are having more fun when the disco kid is in action. The shiny globe makes having a festive attitude irresistible. You never know, maybe that groovy feeling will even spread to the kiddo. One thing is for sure, before walking this baby is going to be moon walking.